I went and got myself a new mobile phone, a Sony Ericsson Cybershot. I do have a mobile and carry it with me everywhere but really only use it for emergencies and so it's usually switched off. I happened to see a mention of this camera phone on a segment on CNN where they were saying you can now get a 5 Mega pixel camera with a mobile phone. You can get a 2 Gbyte card to put in the phone giving you loads of space and you can also take videos as well. So all in all I'm actually very pleased with this purchase. This was also a week where I at last bit the bullet and purchased some plants to go around two sides of my house. Have got one side all planted and hope to have the second side done later tomorrow. For those that are interested I got 4 hydrangea bushes to go on either side of my two sets of steps up to the house and then got ground hugging greenery Jcee Juniper, Jap Garden Juniper, and some heather plants. 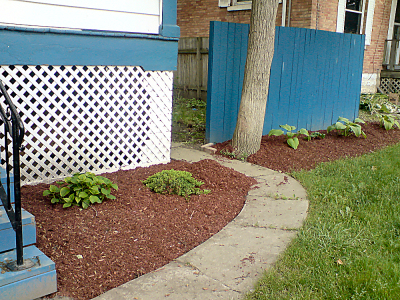 I also got some enhanced red mulch as ground cover to keep down the weeds. I thought I'd mention the MacIntyre Gathering in Scotland as I've been responsible for adding the information to the site which is often added weekly. For those interested in organising Clan Gatherings you might like to read through all the various forms and informational documents that have been added as Marty MacIntyre has really done an outstanding job of organisation as well as organising many local tours and other activities. They are keen that local MacIntyres join in and indeed many local MacIntyre's in the UK are going. A lot of folk are coming from the USA but there are others coming from Australia, Canada, Italy, France, South Africa and New Zealand. New UK legislation is threatening the practice of traditional dances involving swords and sticks. The Violent Crime Reduction Bill recognises and exempts historical re-enactment and sporting activity involving swords from the provisions of the bill, but there is no such exemption for traditional dance, some of which have been using props such as swords and sticks for hundreds of years. These dances are forms of art that are of great historical and cultural relevance. Banning the use of swords will inevitably cause them to die out. It is crucial that they are preserved and allowed to continue. Please show your support and sign the petition to get dance included so that we can continue preserving the beautiful art of sword dance. Whether you are a dancer or not, your support is needed! I also wanted to say that I've added a new search engine on our books page. I've personally used this search engine a great deal when looking for antiquarian and second hand books and so it's as much for me as for you :-) You can try out the new search engine at http://www.electricscotland.com/books/ on the right side of the page. I must say I'm getting quite concerned about email. I am getting more emails and phone calls telling me that emails to me are being returned as "not able to deliver" and this applies both to my electricscotland and gmail addresses. Some folk are using alternative email addresses they have to get in touch. In fact I'm now saying flat out that email is no longer reliable. What we can do about it is another story of course and right now I have no idea what we can do. Aois Community Arcade Games can now be reached directly without going into the Aois community but you still need to be signed in should you want to record your high scores. The web link is http://www.scotchat.org/vbull/arcade.php? Slight hiccup on the move to Michigan... looks like we'll need to put it back 1 week to 27th June. Also sorry about not getting the site search engine up... Steve has had a bit more than he thought to get organised for the move. In the summer of 2005, I was wandering through the grounds of Cawdor Castle near Nairn in Scotland, when I saw the laird's flag flying majestically atop the castle ramparts. It filled me with an overwhelming sense of pride. Wanting to bring back a piece of my heritage, I searched various souvenir shops in Inverness, trying to find my clan flag. Disappointed, I realized such a symbolic representation of my ancestors could not be found. Over the next year, and after much research, I concluded that flags for clan members did not exist, at least not in the way I had envisioned. There were flags with crests, and flags with thistles, but there weren't any that incorporated the tartan of the clan with the crest. So, I set out to create a memento of my heritage, something I would be proud to display at any occasion or venue. What better way to remember our forefathers than to create a flag that reminds us of their courage and resolve? I wanted something my children would be proud to show their friends, a representation of their history and a reminder of where they came from. I wanted to create a quality product, a fitting legacy to a proud and ancient culture. Our products are made to exacting standards and come in a variety of styles and sizes. Each Highland Line flag incorporates either the ancient or modern tartan of the clan and its respective crest. Highland Line flags are intended for indoor or outdoor use. The flags are made to the highest standards from 70 denier high tenacity 'bright' nylon. All flags go through a rigorous process where the colours are locked in for long time use and are double stitched at the edges for added strength. Flags are made from many materials but we chose nylon for its light weight, durability and ability to meet our exacting colour standards. It will dry quickly after a rain and needs minimal maintenance when used outdoors. This weeks Flag is compiled by Ian Goldie and he's mentioned the Oliver Brown Award lunch in which this year the award went to Harry Reid, former editor of The Herald newspaper. In The Herald, Harry still writes a weekly column, which I always enjoy because of his independence of thought. The diet of the Scots is agreeable to their estates and qualities. No people eat better, or have greater varieties of flesh, fish, wild and tame fowl, than the Scots nobility and gentry in their own country, where they can furnish their tables with ten dishes cheaper than the English can provide three of the same kinds; and of their wines, the French themselves did not before the Union drink better, and at very easy rates. The tradesmen, farmers and common people are not excessive devourers of flesh, as men of the same rank are in England. Milk-meats and oatmeal, several ways prepared, and kale and roots dressed in several manners, is the constant diet of the poor people (for roast-meat is seldom had but on gaudy-days); and with this kind of food they enjoy a better state of health than their more southern neighbours, who fare higher. Feeding the rising population on a traditional diet of oatmeal, cheese and meat was an increasing problem, as output of these items could not keep place with the growth of numbers. One solution had been found in the humble but remarkable potato. In 1743 the Improvers had urged their members to increase production of this plant, which could produce a far greater volume of food per acre than any other crop. One of the early converts to the idea of potato-growing was the chief of Clanranald, who returned from a visit to Ireland in 1743, enthusiastically committed to potato growing. By 1800 potatoes provided 80 per cent or so of the diet of the Highlanders. We are onto the P's with Park, Pasley, Paterson, Paton, Patrick, Peden, Pennecuik, Penney and Perry . PATERSON, a family of this name at one period possessed the estate of Bannockburn, Stirlingshire, and also a baronetcy of Nova Scotia, conferred in 1686, but which has been long extinct. In 1745, Sir Hugh Paterson of Bannockburn, baronet, joined the rebellion. His mother, Lady Jean Erskine, was sister of the Earl of Mar, a strong Jacobite connection, and Prince Charles Edward slept at Bannockburn house on the 14th September of that year. Bannockburn house was also the prince’s head-quarters during January 1746. Sir Hugh’s grand-daughter is said to have been privately married to the prince, but she released him to promote the Stuart cause. Another Miss Paterson, belonging to a respectable family at Baltimore, made, in the present century, an equally romantic match, having married Prince Jerome, brother of Napoleon I.; but was obliged to separate from her husband by a dynastic divorce. PASLEY, the surname of a Dumfries-shire family, several members of which have distinguished themselves in the service of their country, James Pasley, Esq. of Craig and Burn, near Langholm, who died April 13, 1772, at the age of 78, left six sons and four daughters. His wife was Magdalene, daughter of Robert Elliot, Esq. of Middlemiln, Roxburghshire, and grand-daughter of Sir Gilbert Elliot of Stobs, baronet. The fifth son, Admiral Sir Thomas Pasley, born March 2, 1734, commanded a division of the fleet under Earl Howe, in the memorable defeat of the French fleet, June 1, 1794, and greatly distinguished himself. For his gallant conduct on the occasion, he was created a baronet of the United Kingdom, Sept. 1, of that year, with remainder, having no sons, to the heirs male of his daughters successively. He married Mary, daughter of Thomas Heywood, Esq. of the Nunnery, Isle of Man, one of His Majesty’s deemsters for that island, and had two daughters, the elder of whom, Maria, married, in 1800, John Sabine, Esq., of the grenadier guards, and had an only son, who succeeded his grandfather. Sir Thomas died Nov. 29, 1808. Keig occupies the north-east portion of the valley of Alford, here shut in by part of the Benachie range on the north, and the Menaway hills on the east, closing in upon the river Don, which intersects the parish. It is bounded on the north by the parishes of Leslie and Premnay, partly along the southern slope, and partly along the ridge of the hills; on the east, by Oyne, down the south side of Benachie to the Don, and by Monymusk up the north end, and along the lap and lower ridge of Menaway, leaving its summit about half a mile to the east; on the south, it is bounded by Tough; on the west, by Alford as far as the Don, and then by Tullynessle, until it joins Leslie at the north-west angle. Antiquities.-There are many Druidical circles in the neighbourhood, and two in the parish. One of them, in a wood on the Cothiemuir hill, within the grounds, and about half a mile north of Castle Forbes, seems originally to have consisted of eleven upright stones, mostly about seven feet high, and except two on the south side placed 15 feet apart, forming a circle of 25 yards in diame-ter. The two towards the south are somewhat pyramidal, about 9½ feet high, 3 feet wide, and 20 inches thick at the base, and only 15 feet asunder, the space between them being occupied by a horizontal subcylindrical mass of stone upwards of 5 feet in diameter, and 13½ feet in length, lying on the west side of the circle. Of these upright stones the two principal ones last mentioned, and three of the others, remain standing,—two are lying on the ground, and the other four are broken. In the middle of the circle is a quantity of loose stones, and near the centre a slab of 4 or 5 feet square, covering a small pit open on the south side. The other circle, which is more imperfect, is situated in a belt of wood, a quarter of a mile north-west of the farm-steading of Old Keig. It is about 66 feet in diameter, and in the circumference of the circle there are two upright stones, 9 feet above ground, with an immense stone lying between them about 16 feet long, 6 feet high, and 5 broad at one end, and differing from the other in being flat on the top, of a quadrangular form, and placed on the south side of the circle. This could be no rocking-stone, and has evidently been used as a stone of sacrifice, there being now no altar stone in the centre of the circle, if it had ever been. These rude circles were places of worship, and generally of the circular form, because it was an emblem of eternity. They were either erected on eminences, that the Druids might see the heavenly bodies, or in groves, because it was deemed unlawful to build temples to the gods, or to worship them within walls or under roofs. [Tacitus de Morib. Germanorum, c. 9.] The rude upright stones by which they were formed were representations of Celtic deities, [Phurnutus de Nat. Deorum, c. 16.] and particularly the square stone, which implies solidity, stability, and the power of God. [Maximus Tyrius, Serm. 38. Pausanias in Acbaicis, Plin. 1. 14, c. 8. Clemen. Alex. Stromat. lib. i.] As these rude obelisks were the first description of images in the world, [Themistius, Orat. xv. Clem. Alexand. Stromat. lib. i.] they were worshipped by the Druids, and appropriately enough formed a part of the temple in their idolatrous system. The large stone, 3 feet diameter, and 13½ feet long, which lies between two of these upright stones in the circle, on the Cothiemuir hill, resembles much the rocking-stone, being now inverted, with its base uppermost, which was so rounded that it might move in a groove, and differs in its nature from the stones of that locality. About this time* there arose a great sough and surmise that some loons were playing false with the kirkyard, howking up the bodies from their damp graves, and hurling them away to the college. Words canna describe the fear, and the dool, and the misery it caused. All flocked to the kirk yett; and the friends of the newly buried stood by the mools, which were yet dark, and the brown, newly—cast divots, that had not yet ta’en root, looking with mournful faces, to descry any tokens of sinking in. I’ll never forget it. I was standing by when three young lads took shools, and, lifting up the truff, proceeded to howk down to the coffin, wherein they had laid the gray hairs of their mother. They looked wild and bewildered like, and the glance of their een was like that of folk out of a mad—house ; and none dared in the world to have spoken to them. They didna even speak to ane anither; but wrought on wi’ a great hurry till the spades struck on the coffin-lid—which was broken. The dead-claithes were there huddled a’ thegither in a nook, but the dead was gane. I took haud o’ Willie Walker’s arm, and looked down. There was a cauld sweat all ower me ;—losh me! but I was terribly frighted and eerie. Three mair graves were opened, and a’ just alike, save and except that of a wee unkirstened wean. which was aff bodily, coffin and a’. There was a burst of righteous indignation throughout the parish; nor without reason. Tell me that doctors and graduates maun hae the dead ; but tell it not to Mansie Wauch, that our hearts maun be trampled in the mire of scorn, and our best feelings laughed at, in order that a bruise may be properly plaistered up, or a sair head cured. Verily, the remedy is waur than the disease. Carbon Printing, Carborundum, Carbro Process, Cardan Shaft, Cardboard, Cardigan Jacket, Cardinal Flower, Cardoon, Cards, Cards Playing, Card Table, Card Tricks for Home Amusement, Card Tricks, Caries: In the Teeth, Carminative, Carmine and Carnation. Regarding the state of matters in this district a correspondent writes us as follows :—I am very glad to learn that you are soon to publish a new edition of your "Highland Clearances." You have done good work already in rousing the conscience of the public against the conduct of certain landlords in the Highlands, who long ere now should have been held up to public scorn and execration, as the best means of deterring others from pursuing a policy which has been so fatal to the best interests of our beloved land. . . . And now, if I am not too late, I should like to direct your attention to a few authenticated facts connected with two districts in the Highlands, that I am familiar with, and which facts you may utilise, though I shall merely give notes. In 1851 the population of the district known as the quoad sacra parish of Rannoch numbered altogether 1800; at the census of 1881 it was below 900. Even in 1851 it was not nearly what it was earlier. Why this constant decrease? Several no doubt left the district voluntarily; but the great bulk of those who left were evicted. 1. Influence and incidental Advantages of Monasteries in early times. 2. Scottish Ecclesiastics at and previous to the foundation of the Abbey. 3. Biographical Sketch of the Abbots of Arbroath, from 1178 to 1606. 4. Causes of the Dissolution of the Abbey. Form of the Church, Towers, Divisions, Columns, Roofs, Doors, Windows: Dimensions of Buildings: External and Internal Appearance of Church: Remaining Statues: Conventual Seals: Bell Rock. On the Decay of Feudal Power and Emancipation of the Rural Inhabitants of Scotland. Of the Life and Times of JAMES MELVILLE, Minister St Vigeans, during the period from 1560 to 1600, being a supplement to the Sketch of the Abbots of Arbroath. From the Records of the Magistrates and Council of Arbroath, illustrative of the Manners and Customs of the Inhabitants about the time of the Reformation. As this minister was for many years the only ecclesiastic of note in the district of Arbroath, after the fall of the monastery and the dispersion of its inmates, and as he was contemporary with, and took a prominent part in, the greatest moral and religious revolution which this country has witnessed, a sketch of his life, and of his connection with the ecclesiastical occurrences of that stirring period, forms substantially a continuation of the religious history of Arbroath during the forty years which elapsed from the Reformation till the end of the sixteenth century. The following remarks on the transition from Romish priests to ministers, readers and teachers in the reformed church, will illustrate an obscure point in the history of the time, and explain some circumstances alluded to in these pages. What became of all the Popish priests after the Reformation? It has been calculated, upon what appear to be fair data, that at that period the whole number of parish priests, monks, nuns, and preaching friars would amount at least to about two thousand; and, with the exception of the bishops and greater abbots, this body of ecclesiastics falls at the era in question as completely into oblivion, so far as our ordinary histories are concerned, as if they had then ceased to exist. A few of them, such as Walter Miln of Lunan, Dean Forrest of Dollar, and Knox, became famed as martyrs for the Protestant faith, or as successful reformers ; and a small number of monks and nuns were allowed to remain during their declining years in some of the monasteries, upon their conforming to the reformed religion. Thus, in 1562, £240 Scots of the rental of the Abbey of Newbottle in Mid-Lothian were set apart for the maintenance of six recanted monks. But the united numbers of both these classes were but a small proportion of the Scottish ecclesiastics of the time; and the state of the country was not such as to admit of their being readily absorbed into other professions, for which, indeed, from age and habit they would be generally unfitted. PART II. - MODERN CURLING. "Faites de porphvre de Gleuormiston, clans le comte de Peebles en Ecosse, la propriete de I'houorable William Chambers, Lord Provost d'Edimbourg. "On emploie ces pierres au jeu Ecossais national qu'on appelIe curling, on on les fait alisser sur la ;lace vers un but, en cherchant a les faire arriver le plus pros de ce but qu'il est possible." The stones were presented to the Emperor Napoleon III. at the close of the Exhibition, but where they are now we cannot say. Who knows but that Prince Bismarck may have annexed theirs along with Alsace and Lorraine, and that they may yet turn up somewhere in the Low Country, to prove that curling not only originated there, but was played with the most advanced style of implements? This fanciful appearance certainly did not have any practical result in France, and when the Comtesse de la Gasparin, in translating one of "John Strathesk's" stories, rendered curling club into club des barbicrs, she no doubt did full justice to the French idea of the game. Of recent years dairy farming has come greatly to the front, and everything pertaining to a cow is of much importance to a large section of the farming community. Dairymen are popularly supposed by their arable brethren to be, in many cases, making their fortunes; but, as the amount of these fortunes depends very much on the cost of feeding and economical management of the stock, the lessening of the outlay is always to be aimed at quite as much as the increasing of the income, and very often offers greater opportunities for improvement; and so a few notes on the subject may not be without interest. These matters have been so often discussed at dairy conferences and elsewhere, however, and there has been so much written about them, that it will be well-nigh impossible to present anything fresh; so, therefore, it is only proposed in this paper to give the principal points connected with the working and feeding of a dairy of cows, with some few comments thereon. It will suit our purpose to divide dairy stock into two kinds—(a) those kept for the supply of milk during summer only, which milk is afterwards manufactured into cheese or butter; (b) and those kept for an equal supply all the year round, especially for town consumption. It is manifest that, at some periods of the year at least, the style of feeding and management must be different for the two kinds. And this now completes the articles from these issues of the Transactions. HAVING thus endeavoured to give a general outline of that portion of the county of Dunbarton which is more especially the subject of this volume, it will be well to mention some details regarding the ancient family of Lennox, to whose representatives at one time the whole of Row and Cardross belonged. The name was originally Leven-ach, a Gaelic term signifying the "field of the Leven." In the plural, Levenachs, was the name given to the extensive possessions of the Earls of the district between the river Leven and the Gareloch, and, in process of time, became shortened into Lennox. It is believed that the founder of the family was Arkyll, a Saxon baron of Northumberland, who also owned large estates in Yorkshire, and who rebelled against William the Conqueror. Along with many other Saxon barons in 1070, he fled to Scotland and received from Malcolm Canmore a large tract of land in the counties of Dunbarton and Stirling. Arkyll married for his second wife a Scottish lady, whose son Alwyn was understood to have been first Earl of Lennox, and to have died in 1160. His son Alwyn being very ycung when his father died, the Earl of Huntington, the brother of William the Lion, was appointed guardian of Alwyn for a long period. His son Aulay got Faslanc, at the upper end of the Gareloch, for his patrimony, and he gave to the monastery of Paisley "the church of Rosneath with all its just pertinents in pure and perpetual alms, the charter having been confirmed to Maldouin, Earl of Lennox, his brother, and by King Alexander II. on 12th March, in the twelfth year of his reign. He also made a donation to that monastery of a salt pit in Rosneath, and of wood for repairs. He also gave to it all the tracts of nets through the whole of Gareloch for catching salmon, and other fish, reserving to himself and to his heirs every fourth salmon taken through these tracts." Maldouin, third Earl, succeeded his father in 1225, and was one of the guarantees on the part of King Alexander III. when the differences between him and Henry III. of England were arranged in 1237. Up to this time the castle of Dunbarton had been the principal messuage of the Earls of Lennox, but, after 1238, when he received a new charter of the earldom, neither the castle, territory, and harbour adjacent remained in the Lennox family. Ever since, the castle has been a royal fortress, and the town of Dunbarton was, in 1222, erected into a free royal burgh with extensive privileges. Frank shaw has done a memorial tribute to Jamie Scarlett who died this week. He was the premier person where tartan was concerned.